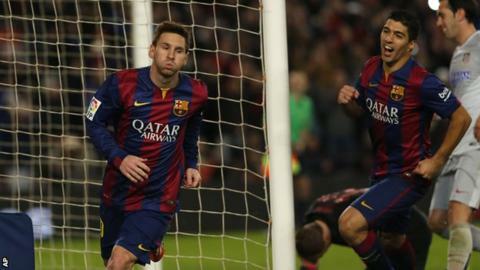 Lionel Messi missed a late penalty but converted the rebound as Barcelona beat Atletico Madrid in their Copa del Rey quarter-final first leg. The Argentine's 83rd-minute spot-kick was saved by Jan Oblak, but the forward was quickest to react as Barca finally broke the deadlock. The penalty was awarded after Sergio Busquets appeared to go down easily under a challenge from Gabi. Earlier, Luis Suarez blazed wildly over from close range. Barcelona dominated possession but failed to create clear openings, with Suarez wasting the first stand-out opportunity of the game. With the goal at his mercy, the former Liverpool striker's rushed attempt was a world away from the clinical finishing that defined his time at Anfield. Fernando Torres, who scored twice against Real Madrid in the previous round, was withdrawn at the break, having seen an attempt on goal blocked by the legs of Gerard Pique. Atletico threatened when Antoine Griezmann headed over when well-placed in the penalty area after a Guilherme Siqueira cross, but again the final finishing touch was lacking. A dull second half sprang to life when Busquets went down in the penalty area, with replays appearing to suggest any contact with Atletico captain Gabi was minimal. From the resultant spot-kick, Messi's shot to Oblak's left was well saved, but the 27-year-old was quickly on hand to convert the rebound for his 29th goal of the season. The two teams meet again at Atletico's Vicente Calderon Stadium on Wednesday, 28 January. Who facing drop also risks the chop? Read more on Which Premier League managers fighting drop could face sack?